Hy Norimichi and fast-talking Yusuke, are goo-goo-eyed over the same elusive classmate, Nazuna. But Nazuna, unhappy over her mother's decision to remarry and leave their countryside town, plans to run away and has secretly chosen Norimichi to accompany her. When things don't go as planned, Norimichi discovers that a glowing multi-color ball found in the sea has the power to reset the clock and give them a second chance to be together. But each reset adds new complications and takes them farther and farther away from the real world - until they risk losing sight of reality altogether. 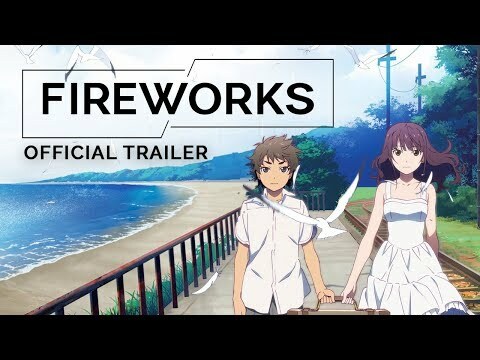 Fireworks was released on Cinema 288d ago in the US and the UK. Notify me when Fireworks is available. Based on 7 Fireworks reviews, Fireworks gets an average review score of 49. The unrealized potential makes the rote line style and stagnant backdrops seem all the blander. The film’s time-travel device mostly just exists to complicate what is, at heart, a trite and sexist love story.